Later today, Mad Duck Posters will be releasing this awesome, officially licensed movie poster for How To Train Your Dragon by Florey! The Australian artist has designed a beautiful screen print depicting brave Hiccup riding atop dragon Toothless, flying over the scenic ocean landscape. 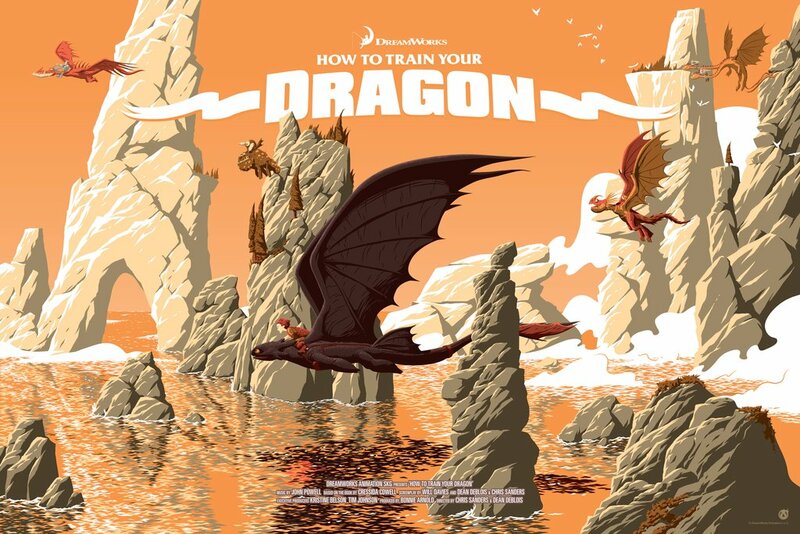 The poster’s variant features even more dragons and characters from the popular animated film as they fly towards their impending battle with the fierce dragon, Red Death! How To Train Your Dragon by Florey is a 36”x24” hand numbered 8 color screen print. The Blue Regular Edition is limited to 215 pieces and will retail for $65, while the Orange Variant is limited to 125 pieces and will retail for $85. Both versions go on sale at 12pm EST today, Wednesday, August 2nd, at the Mad Duck Posters online store.